The US crackdown on Vladimir Putin’s inner circle over Russia’s “destabilising activities” has prompted investors to abandon energy and mining giants controlled by oligarchs, wiping billions off their fortunes. EN+, the London-listed hydropower and aluminium conglomerate majority-owned by Oleg Deripaska, once Russia’s richest man, was in disarray today as its shares plunged by 42pc and it emerged two members of its board had quit. Trading was briefly suspended in the afternoon after the company, which floated in November, admitted it faced a “materially adverse” impact from the new US sanctions. The personal wealth of Mr Deripaska and his family is estimated to have taken a ?2bn hit from the EN+ share price collapse alone. Mr Deripaska owns a 65.2pc stake in EN+ and his family have a further 11.4pc, according to documents filed when EN+ was listed. Pressure was mounting on the company’s chairman, the former Conservative energy minister Lord Barker, as other non-Russians quit the board. EN+ revealed that Frenchman Dominique Fraisse, its independent director, jumped ship as soon as the sanctions were announced on Friday. On Monday, Zhao Guangming, who represented AnAn International, a key backer of EN+’s London float, also quit the board. The company also admitted that Citi, which handles the global depository receipts that allow international investors to back EN+, has closed its books. Mr Deripaska was named on a US Treasury Department list of individuals who “benefit from the Putin regime and play a key role in advancing Russia’s malign activities”. The sanctions are designed to make it almost impossible for affected companies to do business in US dollars. The list included seven Russian oligarchs, 17 senior government officials, 12 energy and mining companies and the chief executive of state-owned Gazprom. 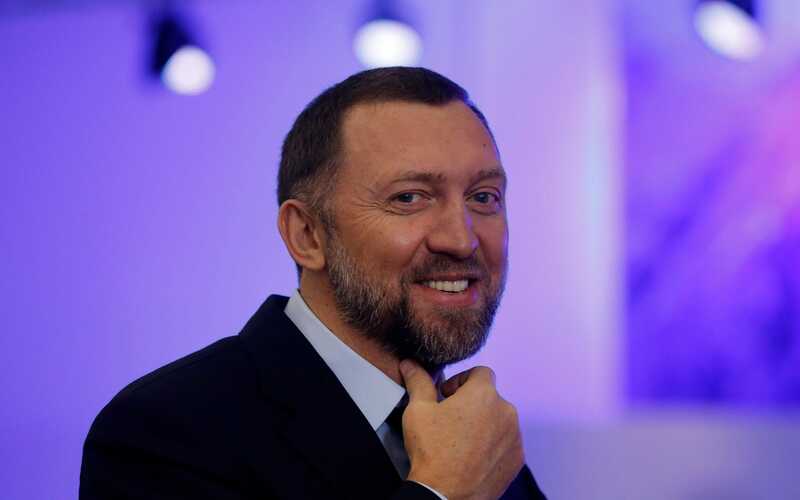 The US has sanctioned eight companies in Mr Deripaska’s business empire, including aluminium producer Rusal, in which EN+ has a 48pc stake. Shares in Hong Kong-listed Rusal collapsed by half on Monday, delivering a ?280m hit to FTSE 100 miner Glencore, which holds an 8.75pc stake. Rusal warned the impact could trigger technical defaults on some of its debts. Glencore is also one of Rusal’s largest customers, with contracts worth $2.4bn in 2017, and its chief executive, Ivan Glasenberg, sits on the board. A spokesman for Glencore said it was reviewing the implications of the sanctions. It had been in the process of swapping its stake in Rusal for a 10.5pc holding in EN+, but that is likely to be delayed or scrapped amid fears of “secondary sanctions” on companies that do business with sanctioned firms. Glencore shares fell 3.4pc on Monday. Shares in other companies linked to Russia but not under sanctions also sank with steel maker Evraz falling 14pc and gold miners Polymetal and Polyus sliding 18pc and 23pc, respectively. The price of aluminium rose 3pc on supply disruption fears. Rusal produces around 6pc of global aluminium output. Russia’s rouble had its biggest one-day fall for more than two years.